There's no question that St. Louis summers can be oppressive, but one of the best ways to extend your swimming season to include those beautiful days in April, May and October is to add a pool heater. At Baker Pool, we install reliable and energy-efficient heaters and heat pumps on many of the pools that we build. Today's heaters deliver fast heat-up times, low operating costs, and long life. They are outfitted with rugged housings and are built to withstand the elements while blending into any environment. 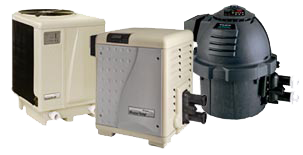 Our pool design specialists can help you evaluate the options and choose the best heater for your needs.